Since Samsung introduced its first smart TV in 2008, every year has brought tweaks to how Samsung Apps are accessed and used. It may not be immediately evident how to find apps on a Samsung smart TV since there isn't an Apps button on the remote. Here are some pointers for how to purchase, download, and use Samsung apps. The following provides an overview of the Samsung Apps platform, as well as archived information for those that may still have older sets. For more details on your specific Samsung smart TV, consult the printed manual (for pre-Smart Hub TVs) or the e-manual that can be accessed directly on your TV screen (Smart Hub-enabled TVs). When setting up a Samsung TV for the first time you should set up a Samsung account. Logging in to your Samsung account on the TV lets you access apps that require payment for content or gameplay. For models earlier than 2017, open Settings from the Home screen, then select System Settings>Samsung Account. You can build your Samsung account using your email address or log in with a Facebook or PayPal account. If your TV doesn't have those options, like for 2010 model year Samsung smart TVs, you have to first create a Samsung Apps account on the Samsung Apps website. Press the MENU/123 button on your remote. Select Menu from the upper left-hand corner of the screen. Choose an image to distinguish your account from any others. Beginning in 2015, Samsung incorporated the Tizen Operating System as the foundation of the Smart Hub interface to access all TV functions, including how Samsung Apps are displayed and accessed. When you turn the TV on, the home menu is displayed across the bottom of the screen. If not, push the Home or Smart Hub button on your remote (different models use different buttons). The Home (Smart Hub) screen, provides access to general TV settings, sources (physical connections), cable, satellite service, and a web browser. In addition, pre-loaded apps are also displayed (e.g., Netflix, YouTube, and Hulu), as well as a selection labeled Apps. When you select Apps, you're taken to a full-screen display of the pre-loaded apps in My Apps, with links to other categories like What's New, Most Popular, Video, Lifestyle, and Entertainment. The categories include pre-loaded and suggested apps that you can download, install, and add to My Apps and place on the home screen selection bar. If you see an app in one of the categories that you'd like to add to your My Apps category, click on that app's icon. After you select the app you will be taken to the install page for that app, which provides information on what the app does, as well as some sample screenshots showing how the app works. To get the app, click Install. After the app is installed you'll be prompted to open it. If you don't want to open the app after installing, you can open it later. If you're looking for an app that isn't on the list, you can see if it's available in the Samsung Apps store using the Search feature, which is located on the top right corner of any of the app menu screens. If you find your desired app, you can install it by following the same steps outlined above. 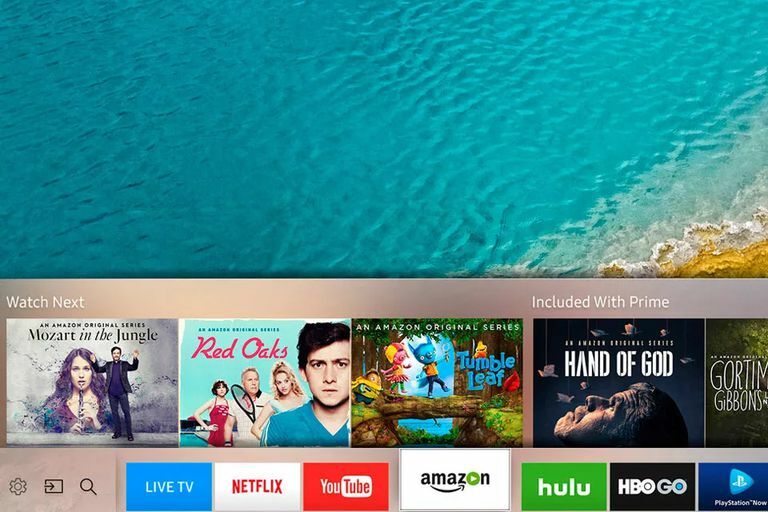 The number of apps available via search is not as extensive as on a Roku streaming stick or box, or other external plug-in media streamer. Most apps can be downloaded and installed for free, but some require a fee, and some free apps require an additional subscription or pay-per-video fees to access content. If any payment is needed, you'll be prompted to provide that information. One alternate way to access streaming apps is via the TV's built-in web browser. However, Samsung might block some channels, and the browser doesn't support some digital media file formats needed to stream content. Samsung introduced the Smart Hub TV interface in 2011, making several tweaks between 2011 and 2014, but accessing apps and account setup is essentially the same as mentioned above. The Smart Hub menu (accessible via the Smart Hub button on the remote) consists of a full screen, which displays your currently viewed TV channel in a small box, while the rest your TV settings and content selection options — including Samsung Apps — are displayed on the remaining portion of the screen. The apps menu is divided into Recommended Apps, My Apps, Most Popular, What's New, and Categories; there's also an additional Games apps menu. With 2011 models, the Samsung App home screen displays the apps by category: Video, Lifestyle, and Sports. Like with the 2015 through 2019 models, you can search for additional apps via the Search function. Downloading and installing, and filling out payment requirements, is done in a similar manner as the most recent system (as described above). To access Samsung apps on models available prior to 2011, go to Internet @TV, either by pressing that button on the remote or choosing the icon on your TV screen after pressing the Content button on the remote. This brings up a screen of the apps installed on the TV, along with an icon to the Samsung Apps store where you can get more apps. In the 2010 Smart TV models, at the top of the app screen, are recommended apps – Hulu, ESPN ScoreCenter, Samsung's Product Video Tutorials called SPSTV, Yahoo, and Netflix. That space eventually fills up with other apps as newer ones are installed. Below the recommended apps is a grid of icons for the apps you've downloaded. Pressing the blue D button on the remote control changes the way the apps are sorted — by Name, Date, Most Used, or Favorite. To add an app to your favorites an, press the green B button on the remote when the app is highlighted. Picture-in-picture is supported so that you can continue watching your TV show while you find the app you want to use. This is helpful for apps like ESPN scorecard that aren’t full screen — they appear over your TV program. After creating your account via the Samsung Apps website, you can add additional users to your account so family members can purchase apps from one main account (if payment is required). Initially, you have to add money to your apps account online. Once you've set up your payment information and activated your Samsung TV, you can buy App Cash in $5 increments by going to My Account in the Samsung Apps store on the TV. To get to the Samsung Apps store, choose the large icon displayed in the bottom left corner of the TV. You can browse through app categories in the Samsung Apps store. Selecting an app brings up a page with a description of the app, the price, and the size of the app. There's a limit to the number of apps you can download as the TV has very little storage space. If you run out of space, you can delete one or more apps from the TV to free up space. Next to the Buy Now button, in an apps description screen, is a button that lets you manage your apps and delete them immediately to make room for other ones. Purchased apps can be re-downloaded free. Samsung Apps expand content access both their smart TVs and Blu-ray Disc players. Now that you know how to get and use Samsung Apps, find out more about the different Samsung apps and which Samsung apps are best. In addition to Samsung's smart TVs, many apps are also available through their Blu-ray Discs players and Galaxy smartphones. However, not all Samsung Apps are available for use on all Samsung App-enabled devices.